She was like a creation of God which he does whenever he is in a very special mood as a very very special gift to mankind. My journey to Sridevi started when I was preparing for my debut film ‘Shiva’. I used to walk from Nagarjuna’s office in Chennai to a neighbouring street where Sridevi used to live and I used to just stand and watch Sridevi’s house from outside her gate. I just couldn’t believe that the goddess of beauty lives in that stupid looking house. I say stupid because I believed that no man made house deserved to house that beauty called SRIDEVI. I used to so desperately hope to catch a glimpse of her as she went in or out of her house. But sadly no such thing ever happened. He arranged a meeting with her and took me to meet her at that very same house where I used to stand outside the gate and stare. At night we went and as luck would have it there was a power cut in her house. so I was sitting in her living room in candle light along with the producer waiting for the angel to appear and my heart was thumping like mad. Her mother told us she was busy packing as she was about to catch a flight to go to Mumbai. 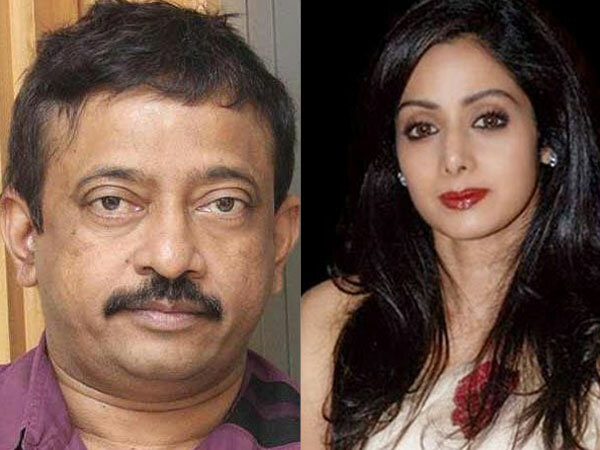 As we were waiting, every once in a while Sridevi was rapidly crossing the living room as she was moving from one room to another room in a rush to finish her packing even as she apologetically smiled at me for the delay. Everytime she was appearing and disappearing in a flash and the director in me started slow motioning her and running her backward and forward for my visual pleasure. Finally she came and sat in the living room, just said a mandatory few lines that she would very much like to work with me and then she left for Mumbai. I continued talking to her mother with enormous respect and awe because she actually gave birth to Sridevi. I went back to my place feeling like I was in the seventh heaven. The way Sridevi sat in front of me in the candle light got imprinted in my mind like an exquisite painting and with her image completely filling both my mind and my heart I started writing Kshana Kshanam. I wrote Kshana Kshanam with the one and only purpose so as to impress Sridevi. Kshana Kshanam was intended by me as a love letter to her. Throughout the making of Kshana Kshanam,I just couldn’t take my eyes off her charm, her beauty,her personality and her demeanour was a new discovery for me. She had an invisible wall around her and she does not let anyone cross that. Behind that wall she maintains her dignity and her self-respect and she never lets anyone inside. Sridevi is the most beautiful and the most sensuous woman,God ever created and I think he creates such exquisite pieces of art like her only once in a thousand years. I thank God for creating Sridevi and I thank Louis Lumiere for creating the movie camera for giving us an opportunity to contain her forever. I love you Sri wherever you are… and I will always love you.